The Montana Repeater Link Association is a group of repeaters supported by several operators. The repeaters are normally linked full time. They are located in Pompeys Pillar, Billings, Greycliff, Bozeman, Three Forks, Helena and Great Falls Montana. Pompeys Pillar (KF7FW) 147.180+ MHz. 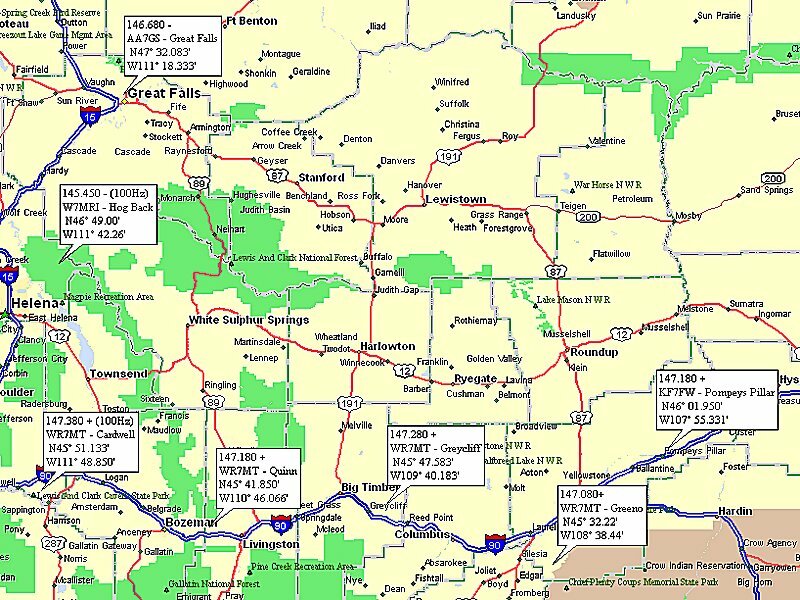 Billings (WR7MT - Billings) 147.080+ MHz. Greycliff (WR7MT - Greycliff ) 147.280+ MHz. Bozeman (WR7MT - Bozeman) 147.180+ MHz. Three Forks (WR7MT) 147.380+ MHz 100Hz Tone. Helena (W7MRI) 145.450- MHz with 100Hz Tone. Great Falls (AA7GS) 146.680- MHz.